In small bowl, stir together vinegar, water, sugar and salt. Add carrots and radishes; cover and refrigerate 35 to 40 minutes or until vegetables are lightly pickled. Drain; cover and refrigerate until ready to use. Meanwhile, heat 10-inch nonstick skillet over medium-high heat; add beef and 1/2 teaspoon of the sesame oil. Cook 6 to 8 minutes, stirring occasionally, until brown; drain, and set aside. Reduce heat to medium. Add remaining 1 teaspoon sesame oil, the garlic and gingerroot to skillet. Cook and stir about 1 minute or until garlic is fragrant; add beef, green onions, soy sauce, fish sauce and honey. Stir well. Add broth; heat to simmering. Simmer 13 to 15 minutes, stirring occasionally, until broth is mostly absorbed. 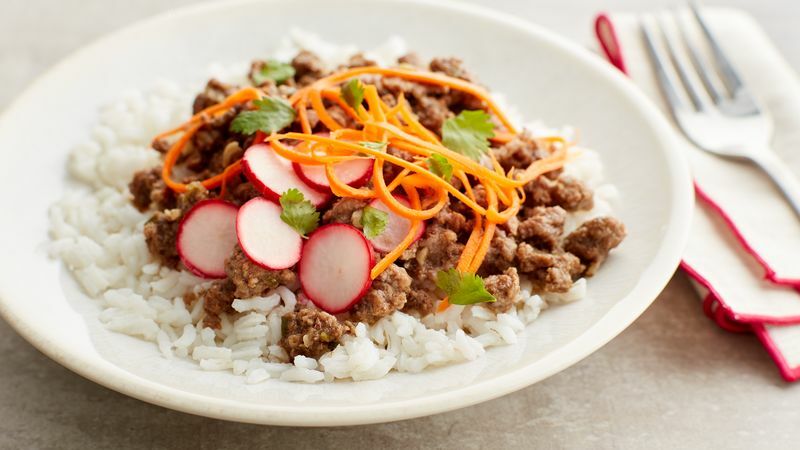 Serve over cooked rice; top with pickled vegetables and cilantro. If you like jalapeño chiles, try adding 2 tablespoons of thinly sliced jalapeño to the vegetable mixture. Top the bowl with Sriracha sauce for extra flavor.